Vineyard 5M3, 36 in. x 24 in. Laser Inked Imaging on 6 in. Tumbled Marble Tiles. Every Tile is finished with our custom sealer adding lasting endurance and beauty. Murals are designed for installation as backsplash, in bathrooms, on floors or above mantels. Install with Thinset. 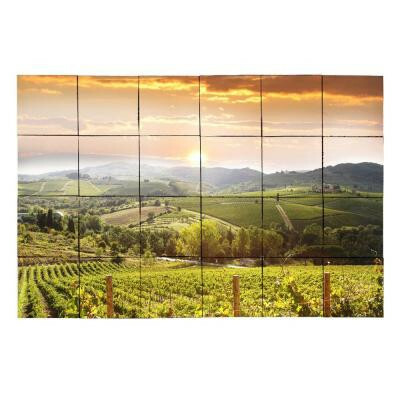 Lush rolling hill vineyard with an electric sunrise, can add a touch of Tuscany to any room. You can buy this product in our internet market. We will be glad if you make the right choice. 6 square feet, 24 pieces per case. Case weight 36 lb.